Bolinao, a town at the tip of Luzon's western peninsula is primarily a flat land lying below the plains just by the hills of Bani, Pangasinan. Although primarily a farm land, there are small rivers coming from the elevated lands of Bani that are rushing down to the shores of Bolinao. One of quite unexpected wonder of this topography is the existence of a waterfall in the middle of plains. Bolinao Falls is a short waterfall which is a result varying elevations of the Balingasay River, thus the water falls down to a pool of water located on a lower elevation. The "falls" system is part of a stream to which is the water from the Balingasay river is flowing from, then down to the West Philippine Sea. 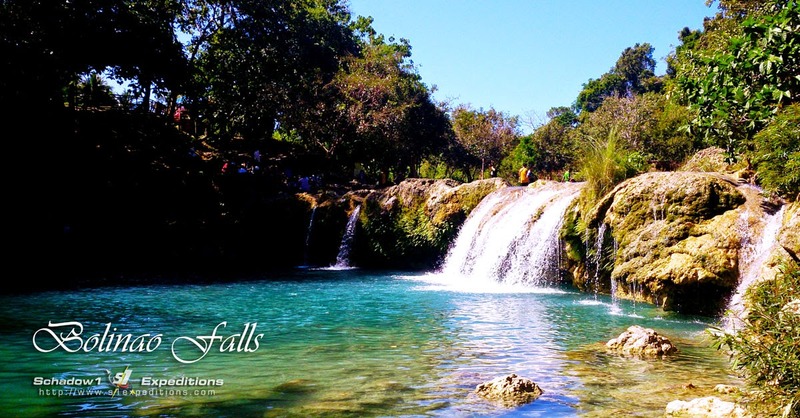 Bolinao Falls is about 19 kilometers away from Bolinao town proper in the middle of a wide field; to which one need to survive 6 kilometers of dirt and rocky road from the national highway of Bolinao. Its location is exactly in the middle of dirt and grasslands of Bolinao between Patar Beach and the main highway (Coordinates 16.30773N 119.86535E). 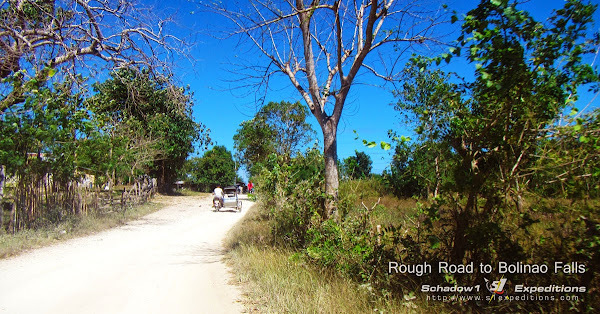 But because the road from Patar to the falls is not yet established, the safer way to get to the water falls if coming from Patar, is to go around back to the town proper and head back south past the intersection to Anda, Pangasinan. Previously, the waterfall is accessible for free however by January 2015, they now collect Php 50 entrance fee and a Php 20 parking fee whether you brought your own vehicle or rented a tricycle as your transportation around Bolinao. 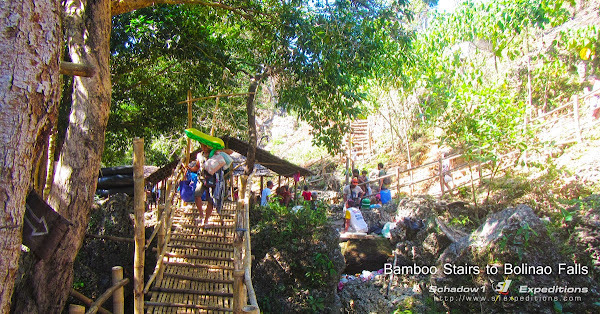 From the parking area, you would climb down bamboo stairs to reach the falls. Cottages are available at the side of the stream and are good shelters for having picnics. But be aware that the place gets easily crowded on holidays. The stream has 3 pool levels. If you are planning to take a swim, it is best to do it at the pool which is most elevated among the three so the water remains fresh. If there are too many people, the lowest pool easily gets murky. The Bolinao Falls is a part of our side trip in Bolinao and we hired a tricycle to help us tour the whole town for two days and cost us Php 1,200. Our trip to Bolinao is part of our 2014 year-end mapping expedition of Batangas to Benguet (Mt. Pulag) to Pangasinan via Calasiao to Dagupan and to Bolinao. Mapping data acquired from the expedition has been contributed to Openstreetmap Philippines with a goal to provide a recently updated, and precise street-level mapping data of the country for use for navigation guidance, tourism, outdoor recreation, and disaster resiliency planning. Our mapping data is also being compiled regularly to GPS-assisted navigation devices format and can be download for free on our #mapPHL page.